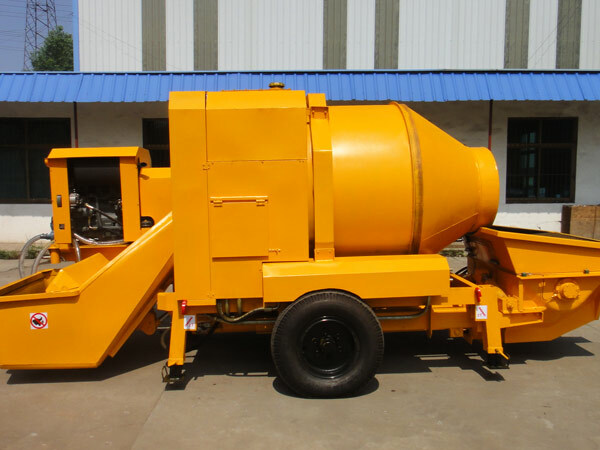 With rich experience in manufacturing and exporting construction machine to more than 50 countries all over the world such as Pakistan, Kenya, the Philippines, Vietnam, Myanmar, Seychelles, Indonesia, Sri Lanka, Russia, Fiji, Kuwait, Congo, Algeria, Sierra Leone, Uzbekistan etc., we can provide customers not only high quality concrete pump mixer for sale at reasonable price, but also reliable services. 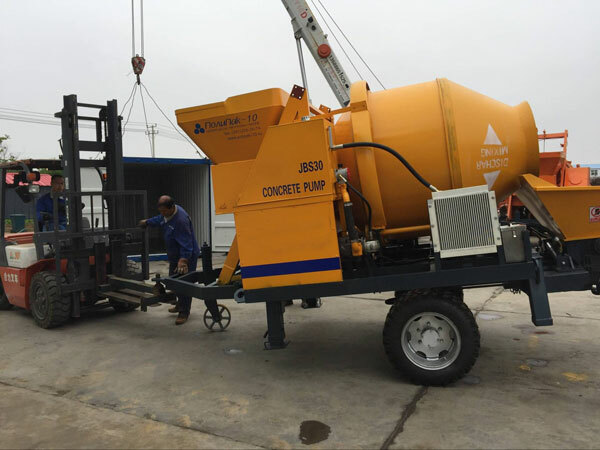 If you need a concrete mixer and pump, please don’t hesitate to contact us. 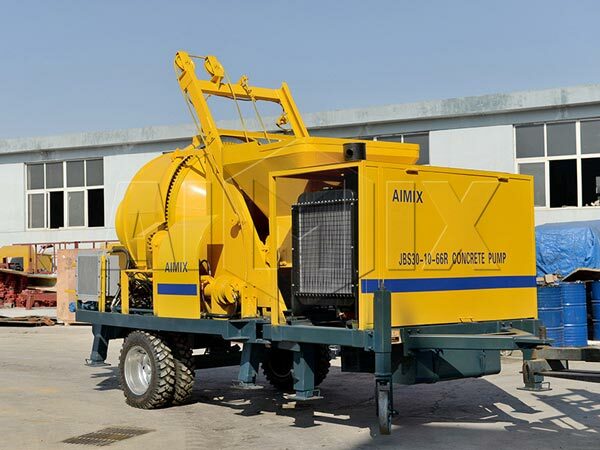 Aimix concrete mixer and pump is one of the most commonly seen machine in varieties of construction sites, and our concrete mixer pumps for sale are often employed to convey concrete with different specifications to the required sites, and users don’t need to buy a single shaft or twin shaft mixer any more after buying a concrete mixer and pump. Since its launching into construction market, Aimix concrete pump with mixer has extensive application in a great number of engineering projects such as high-rise buildings, water conservancy, flyover, bridges and so on. 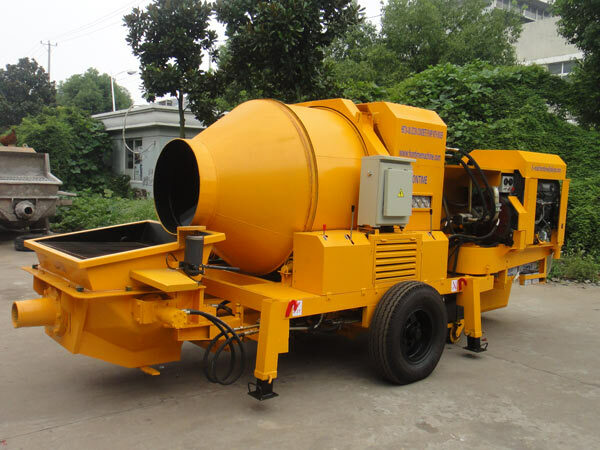 Generally speaking, we divide our concrete mixer pumps into diesel concrete mixer pumps and electric concrete mixer pumps. Diesel cement mixer pump has unique advantages in the mixing and pumping of concrete in one machine, which totally combines the function of and diesel concrete mixer for sale and concrete pump, and it has high mixing quality and pumping efficiency, which saves lots of costs and time for investors. 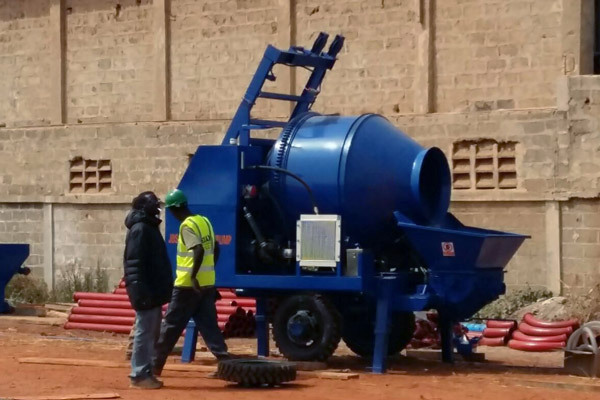 Why not try our concrete mixer pumps for sale? The electrical type concrete pump with mixer has greatly improved the electrical control system, which reach a high level of automation. It uses advanced hydraulic pump with high reliability and safety. The lubrication system can ensure sufficient oil feeding with high efficiency and energy saving. It is easy operating, cost and labor saving. 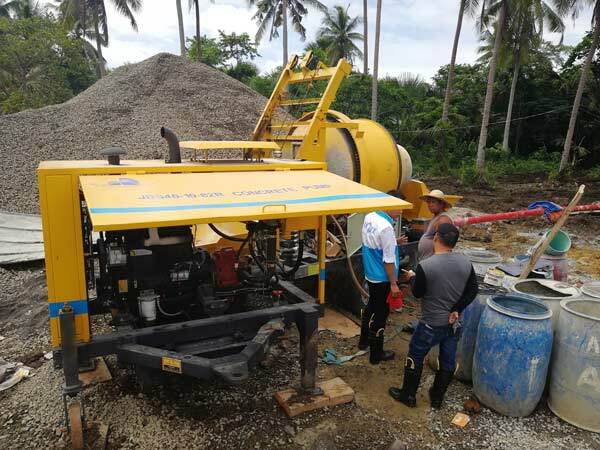 The electric concrete pump mixer can make uniform concrete and pump concrete smoothly along the pipeline with stable performance. S-valve: It adopts advanced s-valve to reverse with no congestion, which can transport mortar concrete and commercial mortar concrete. The s-valve can compensate wear clearance automatically with good sealing performance. Anti-pumpingfunction: it has anti-pumping function, which is benefit to timely troubleshoot the non-working pipes and stop work to wait for concrete in a short time. Glass plates and cutting rings: They all use wear-resisting hardness alloy materials, which can prolong service life.The longest life of glass plates can reach over 30 thousand cube. High pressure in outlet: That can satisfy the pumpingneeds of high-rise building and remote distance construction. Lubrication system: It adoptsautomatic centralized lubrication system, which can ensure efficient lubrication in the working process. Air-cooling system: The hydraulic oil cooling adopts air-cooling system is convenient to use with good cooling effect. It ensures that hydraulic system of oil temperature is controlled under 70℃. Moreover, it is not easy to pollute the hydraulic oil. Displacement: It can change the displacement manually, which can meet the different discharging speed demands of users. Wireless control: The equipment uses wireless remote control technology, improving the control distance. The product is easy operating with humanization design. 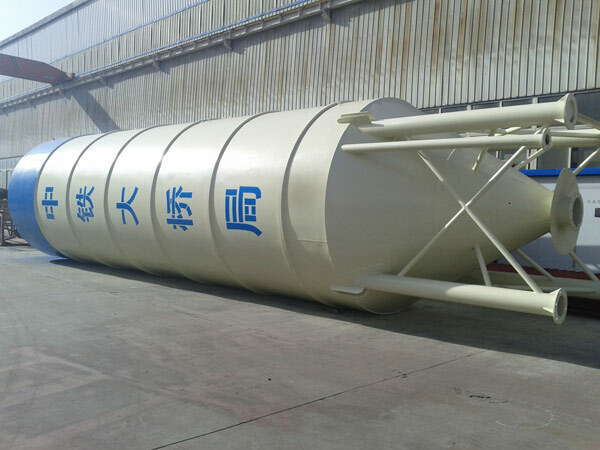 Anti-wearing concrete cylinder: The use of concrete cylinder increases the lifespan of concrete pump and reducesthe cost of maintenance. Main oil cylinder: The main oil cylinder plate chromium in inner bore, the new technology can solve the problems of main oil cylinder damage due to dirty oil. Please kindly inspect the lubricating grease scale which decreased in the box everyday. The quantity decreased is fixed each day. If decreased less means there are some lubricating point was blocked need to check and solve the problem. It need to change clean water in the water tank before the pump working everyday. The water level should be covered a little of the piston rod position. If the water level is too high would spill out and easy to break the proximity switch. Some lubricating point of concrete cylinder swing arm position should manually add oil by grease gun. 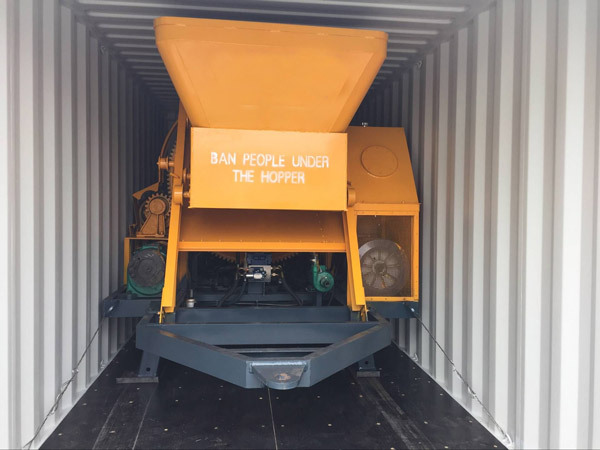 There is an large-diameter screw nut at back of concrete hopper, it need to be tightened by the wrench in the tool box. Otherwise the glasses plates and cutting Loop which in the concrete hopper were easy loose and break when the pump working, This situation appears as the water cannot drive into the pipeline when cleaning. Each part of new concrete pump which have screw should check and tight frequently when one day work was finished. It should prepare one bucket filling clean water when Disassemble the pipeline, Put the clamp and rubber gasket into the bucket to clean. After drying out put the clamp which are screw position into waste engine oil could longer the clamp and rubber gasket working life. 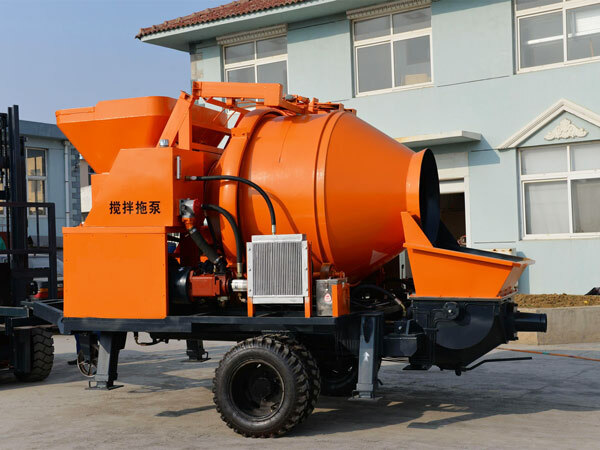 Concrete pump and mixer is a favorable machine for many investors. 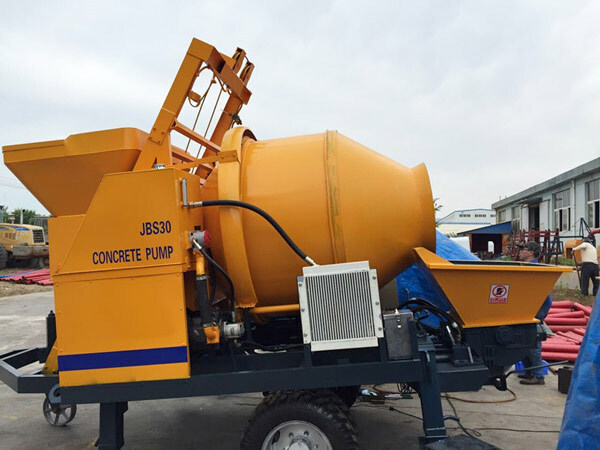 Based on its working process, a concrete pump mixer can be divided into driving system, main oil cylinder, hydraulic system, pumping system, hopper and pumping pipelines. 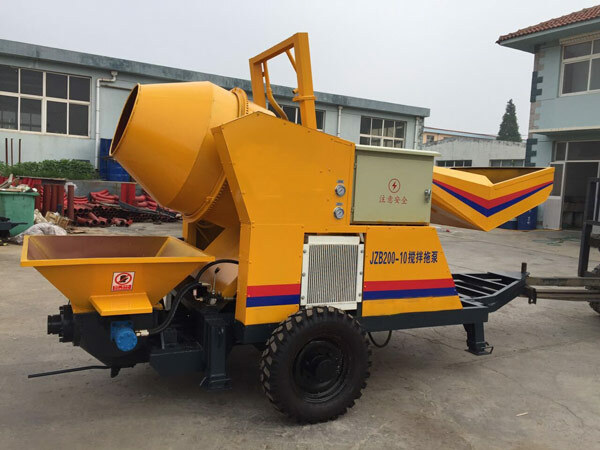 To meet the needs of different construction projects, Aimix concrete mixer with pump can be divided into electric cement mixer and pump and diesel concrete mixer pumps for sale. In addition, we also offer other machine for sale, such as mobile concrete batching plant, stationary concrete plants for sale, concrete drum mixer, compulsory concrete mixer, concrete pan mixer for sale, mobile concrete mixer, self loading concrete mixer for sale and so on. Generally speaking, hydraulic system transfers electrical power or thermal energy into mechanical energy. It is designed as double-circuit closed type and it is responsible to supply primary pressure for concrete cylinders. 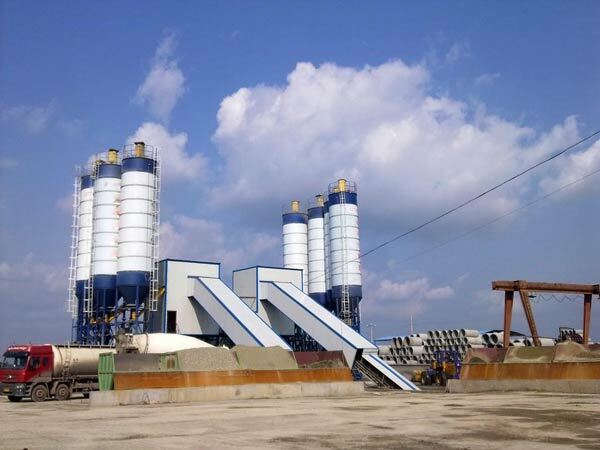 There are two concrete cylinders of the machine which can realize concrete pumping at the same time. These two cylinders are coated with a layer of nickel alloy to strengthen their abrasion resisting performance. With the pressure supplied by hydraulic system, pumping system is featured with stable pumping performance and long pumping distance. S distribution valves are the spot light of the pumping system. It is well-accepted for excellent sealing performance and nice wearable capacity. Besides that, it has the characteristics of flexible direction reversion, which ensures concrete pumping efficiency of the machine. Concrete pump with mixer can be a very important concrete pumping equipment, and welcome to contact us to check our hot models. Pumping system of our concrete mixer pump has high quality and easy operation. Closed type hydraulic system can largely reduce working noise and ensure comfortable working environment. Independent cleaning system of our pump mixer provides convenient cleaning and prolongs the service life of pumps. Our concrete mixer pump has long horizontal and vertical pumping distance, which can totally meet you pumping demand and requirements. 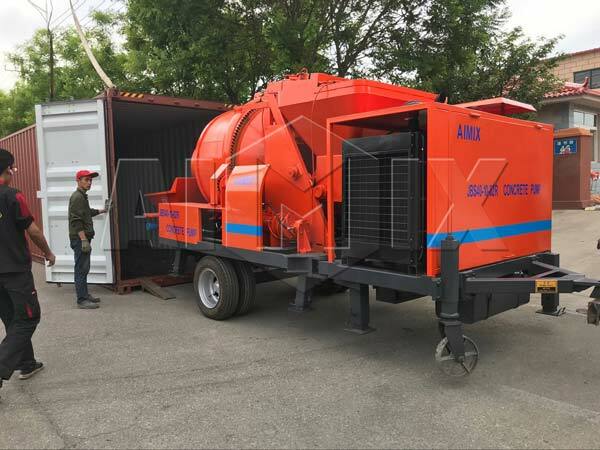 Zhengzhou Aimix Group has long concrete pump production history, and we offers many types of concrete pumps, such as trailer concrete pumps for sale, mini concrete pumps for sale, small concrete pumps for sale etc. We adhere to the principle of innovating with technology and develop with talents. Since being established in 1982, we constantly absorb progressive technology and sum up our own manufacturing experience to keep pace with times. It is for sure that construction machine made by our company are trustworthy to be your good options. 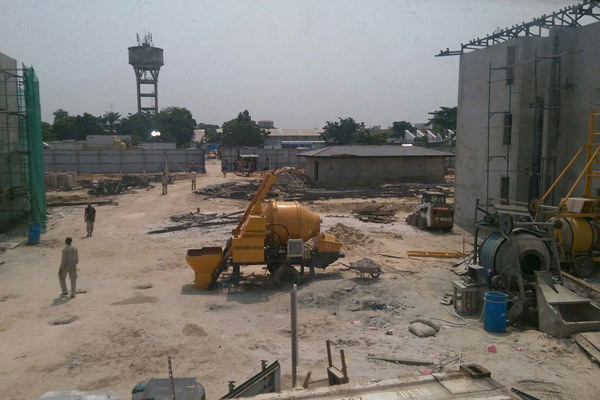 Welcome to contact us if you have needs of concrete pumps.